Chicago (AFP) - Defensive end Khalil Mack became the highest-paid defender in NFL history on Saturday, signing a six-year deal worth $141 million with the Chicago Bears after a trade from Oakland, according to multiple reports. The 27-year-old American, selected fifth in the 2014 NFL Draft, is known as one of the league's top pass rushers and was the NFL's 2016 Defensive Player of the Year. 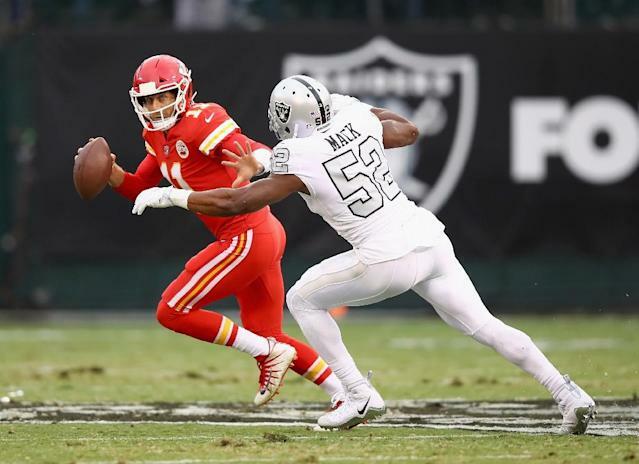 According to a report on the NFL's website and ESPN, Mack's contract extension will see him paid $155 million in all over seven seasons, with $90 million guaranteed. The deal would see the Bears send Oakland first-round picks in 2019 and 2020 plus a later-round pick in each year. The Raiders would also ship Chicago 2020 second- and fifth-round selections. The move came a day after the Los Angeles Rams gave defensive tackle Aaron Donald a six-year extension worth $135 million with $87 million guaranteed, the previous top NFL terms for a defender. Mack becomes the fourth and youngest NFL player to be traded after winning Defensive Player of the Year honors. In four seasons with the Raiders, Mack made 40.5 quarterback sacks in 231 tackles. Mack missed the entire pre-season and training camp for the Raiders in hopes of a trade or better deal. His trade came on the deadline day for clubs to seal their rosters before Thursday's start of the new campaign. While the Raiders lose a star player, they could add more long-term talent for future seasons. The Raiders are scheduled to move to Las Vegas for the 2020 NFL season.